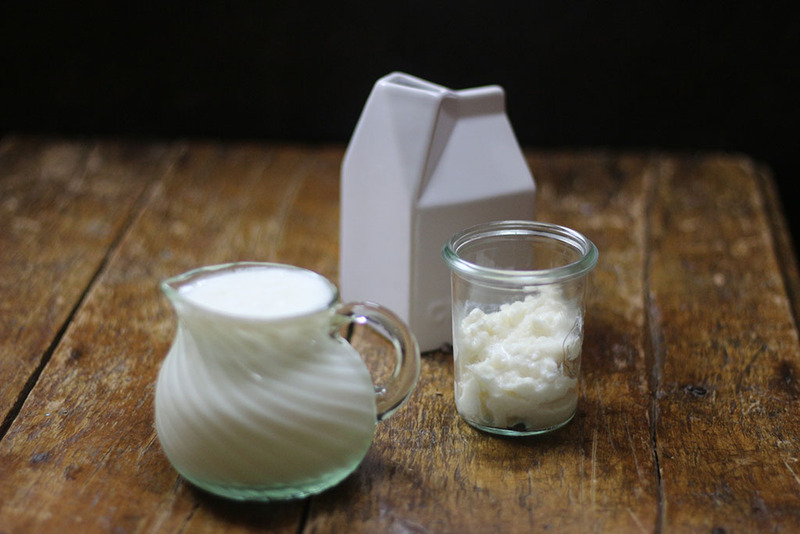 You can make kefir with a variety of milks – dairy, goats milk and non-dairy milk. Most milk-types are acceptable, including whole milk, fat-reduced, non-fat, pasteurized and homogenized. Fresh raw whole cow’s milk is delicious too! Please don’t use ultra-pasteurized milk when making kefir. Your kefir won’t do well. 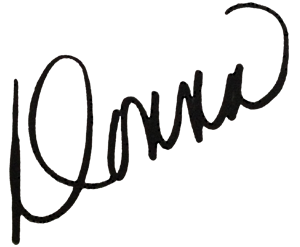 Many times organic milk that you purchase from a store is ultra-pasteurized, even if it does not say ultra pasteurized. So if you choose to use organic milk, make sure you know what you are getting and that it’s not ultra-pasteurized. The problem is that ultra-pasteurized milk is heated at high temperatures for longer than regular milk, causing many problems when making kefir. 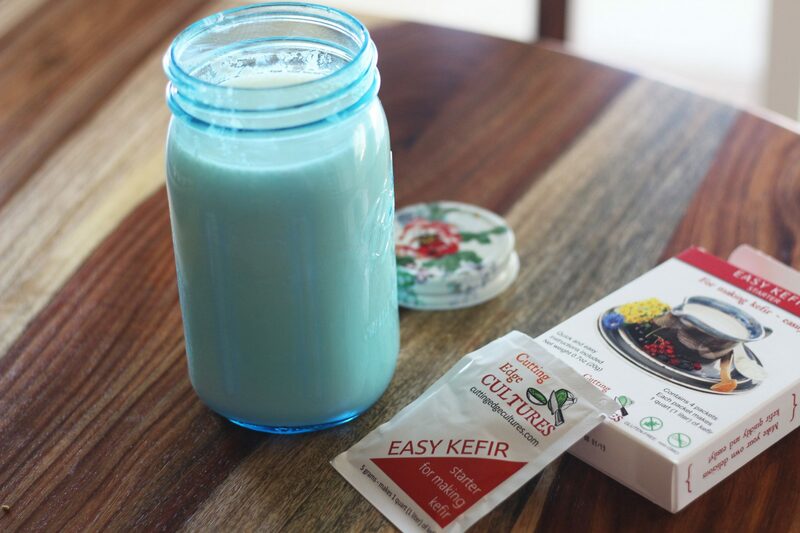 Remember that kefir will add enzymes and good bacteria to pasteurized milk and make it a new food; but when it is ultra pasteurized or heated for long periods, the milk is no longer viable for making kefir. Any other type of milk, including raw milk that you get from your local farmer, is still perfectly fine! 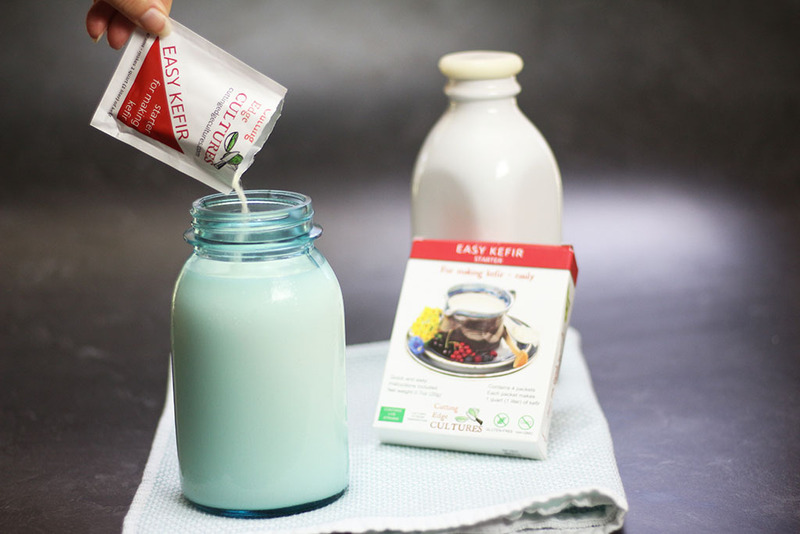 Non-dairy milk can make kefir, too, be it coconut, almond, cashew, oat, flax, and more! You will then decide which type of starter culture to use. 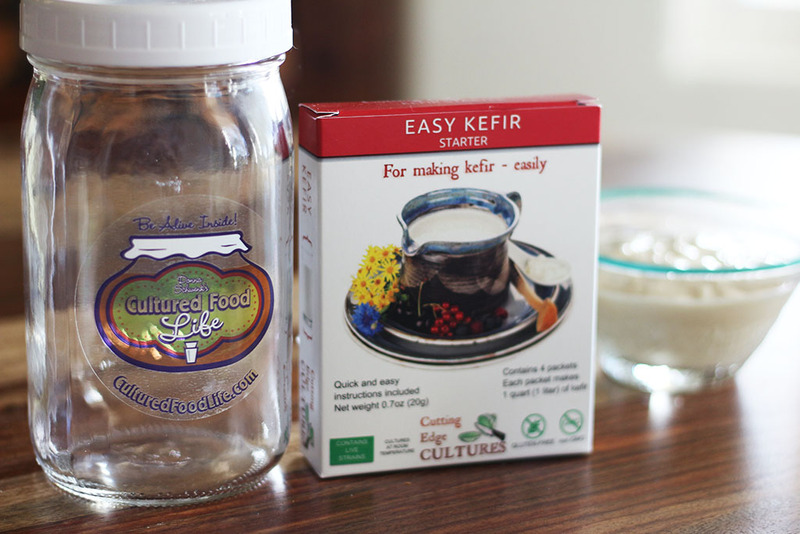 We have two options, Live Kefir Grains or Easy Kefir powder packets. 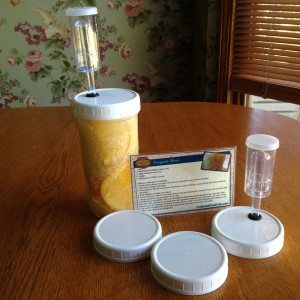 Kefir Grains are a wonderful way to make kefir. They will reproduce and last a lifetime (if you don’t kill them with heat or starve them by not feeding them). I’ve had mine for almost two decades and they keep making me kefir, and grow and double in size each week. 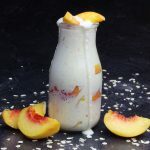 Kefir grains are not really grains but rather combinations of good bacteria and yeasts that infuse your milk or non-dairy milk with over 50 good bacteria and good yeasts. They look like little pieces of cauliflower and feel a little rubbery. They’re tough little guys and you can pull them apart, and they just grow more. Kefir grains are a little like having a pet. You have to feed and take care of them but that’s easy to do and I can show you how. I love my kefir grains and they changed my life and health. I still have kefir every day. It’s a must for me and keeps me healthy! You will need to either find or purchase kefir grains. 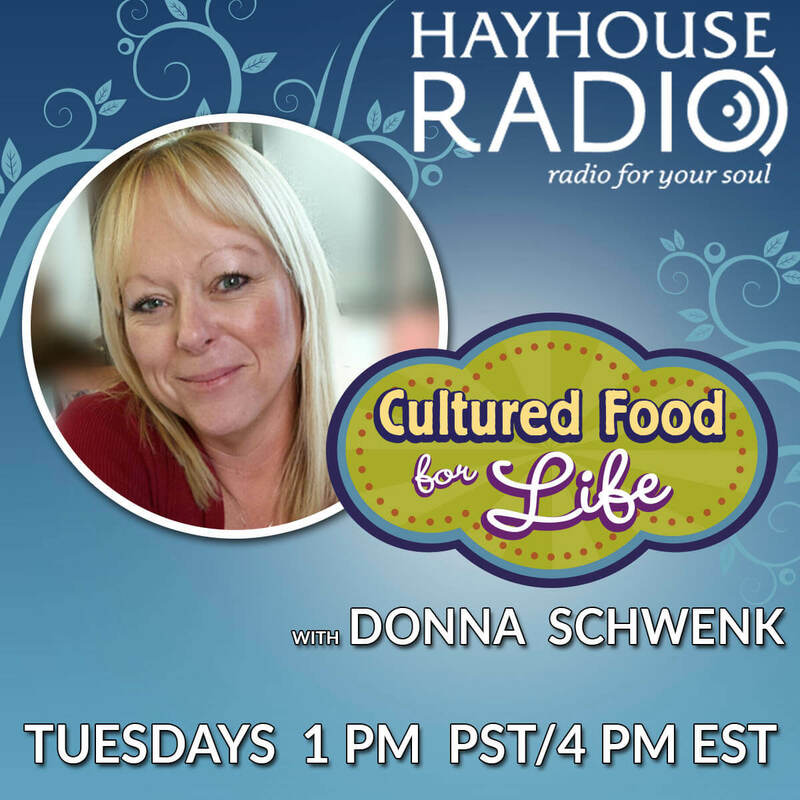 Donna’s Live Kefir Grains – My personal kefir grains! 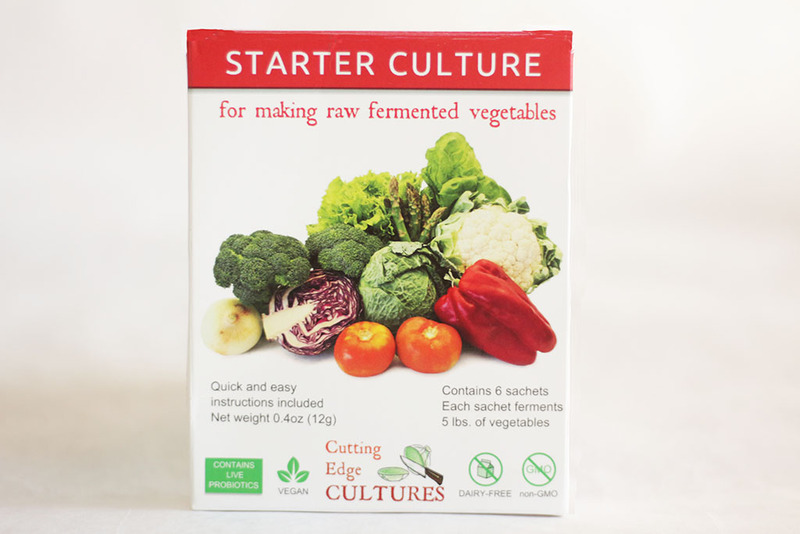 Now that you’ve gathered your ingredients and starter culture, click on the recipe you need for the method you chose. 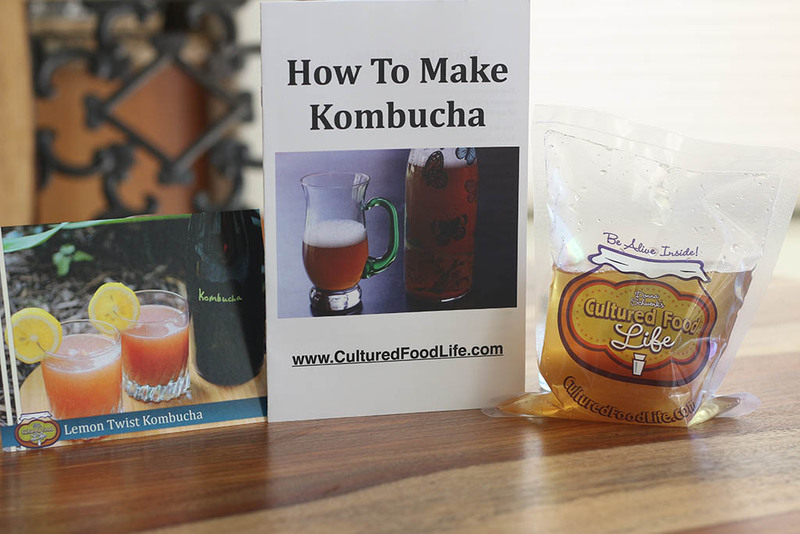 If you are using live kefir grains, watch this video or click this recipe. 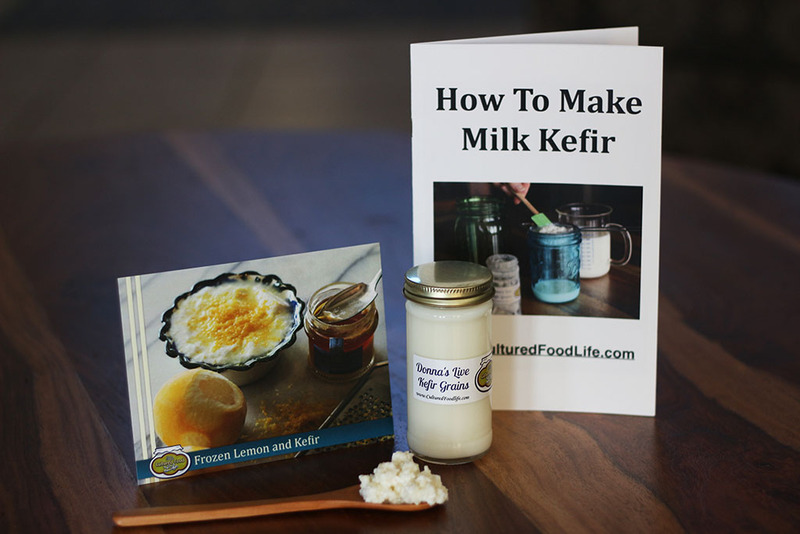 The video teaches how to make kefir with live grains, how to make kefir cheese, and how to second ferment your kefir. It also has lots of information about why kefir is so good for you. Once you get the hang of making kefir, I encourage you to start second fermenting it. 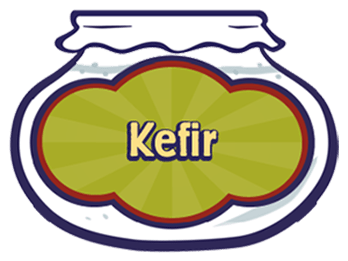 Not only does second fermenting increase the nutrients in your kefir, it also makes it taste a LOT better! I always second ferment my kefir. It’s not hard and I encourage you to try it and see the difference! Place your kefir grains in milk. If you have 1 tablespoon of grains, store them in at least 2 cups of milk, 3 is better. I like to make sure that they have plenty of food to eat. If you have more grains, add more milk accordingly. Then you place this in the refrigerator. This will last for one week. Coming home: When you return home strain off the milk that the grains were resting in and discard (you can also give this to pets!) and put them in new milk to make kefir. The grains will be a little slower making kefir when you first take them out of the fridge. The cold slows them down a bit, but the second time you make kefir they will be back up to speed. If you’re going to be gone for more than one week, then I recommend you freeze them in milk. Store them in a jar in the amount of milk you regularly use, leaving a little room at the top for expansion when it freezes. 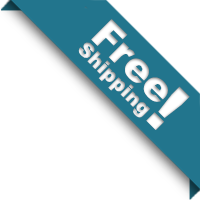 Store in a glass or food-grade plastic jar with a lid and place in the freezer. You can store this for several months and they should be fine. They will take a little while to wake up when you remove them from the freezer, but once they thaw, strain them and give them fresh milk After a few days of making kefir, they should be fine. You will need to discard the milk they were stored in. Freezing kefir grains should only be done once in a while. Freezing and thawing them continuously can diminish or kill them, but once or twice a year should be fine. 353 Responses to "How to Make Kefir"
A friend gave me some kefir grains and I followed the instructions on page 53 of your book Cultured Food for Health, where it says 1 tablespoon of kefir grains per 3 cups of milk. I checked tonight and the milk has not changed much at all in 24 hours. I wanted to find out what I did wrong so I went to your website. There I found the kefir making video and the instructions in the video were different. 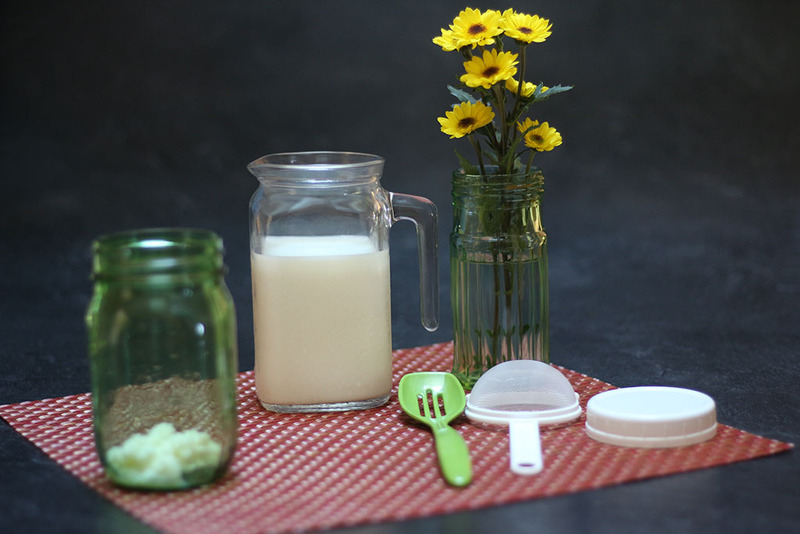 It was indicated that you use 1 tablespoon of kefir grains to 1 cup of milk. Which one is the correct one? I am not sure about leaving the mixture on the counter (now 26hrs) so I will put it in the fridge until I hear back. 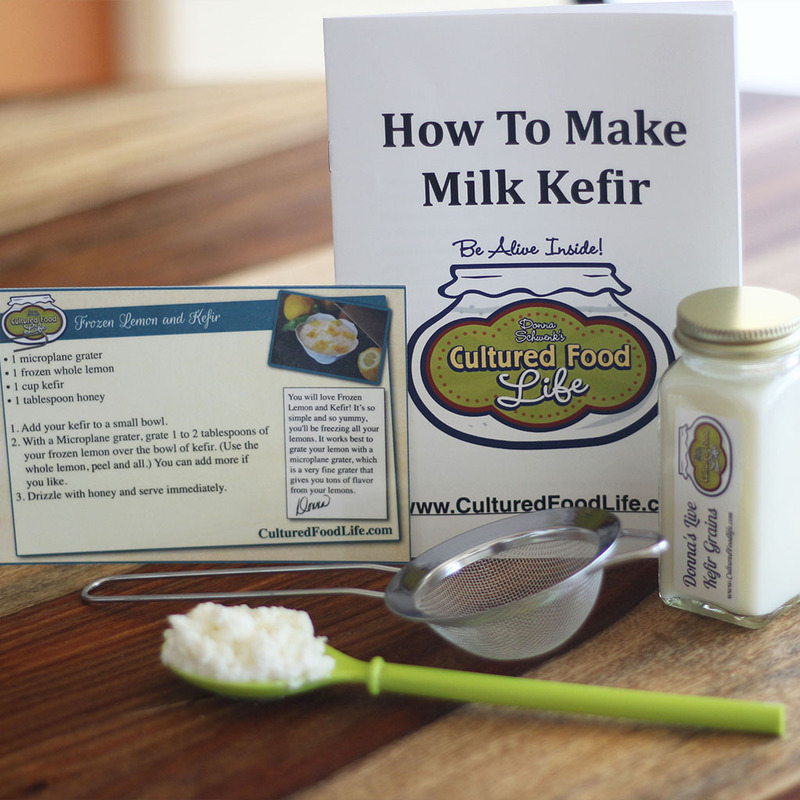 Do you use raw milk with the kefir grains? I do but it can be very expensive. $10 for 2L in Australia. Would you recommend using nonhomogenised + pasteurized organic milk as an alternative? I do use raw milk but have also used pasteurized milk as well and they both turned out great! 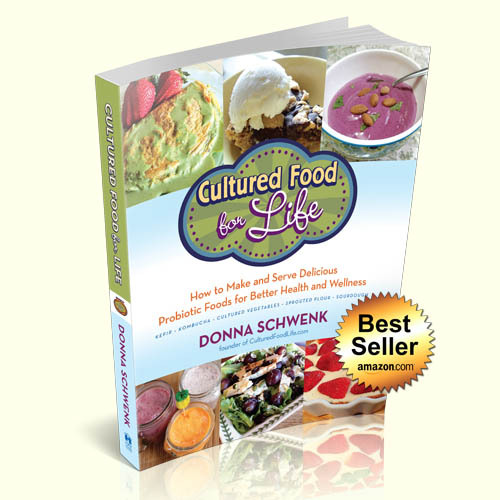 Donna, I live in the Kansas City area as you do—where is the best place to find/purchase raw milk? 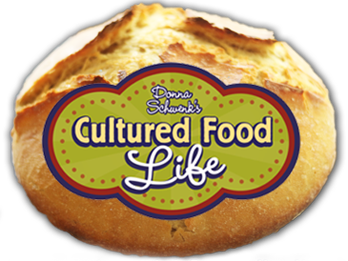 Can you send me an email at support@culturedfoodlife.com? Hi if i buy lovingway kefir, is it the same thing? Hello my friend is giving me so water kefir grains can I use these with milk or should I just start a new? You need milk kefir grains to make milk kefir. You can’t interchange them as that have different properties. I have seasonal allergies and have itchy hives on my neck and face. I don’t want to take prednisone or toxic antihistamines suggested by my doctor. 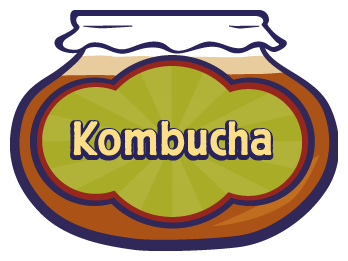 I’ve just started making kefir and kombucha. Will these help my hives situation or aggravate the problem? 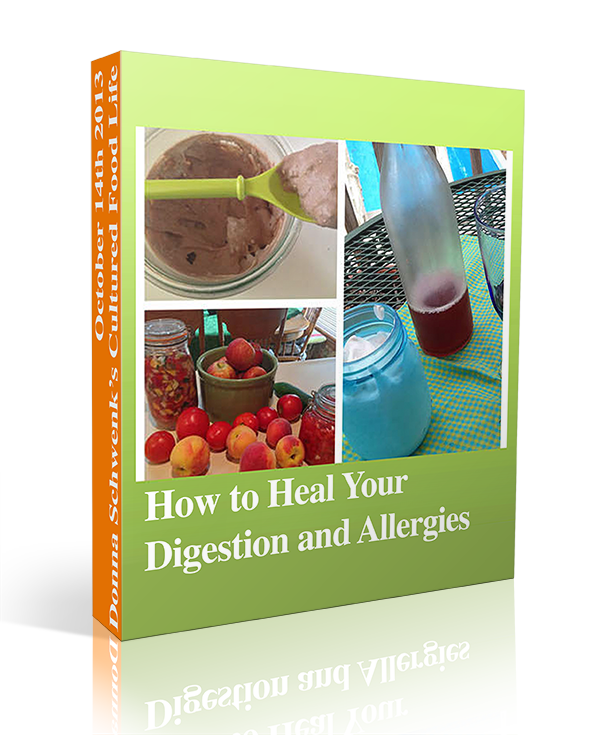 Strengthening your adrenals and cleansing your liver would be really important for you. So I think I messed up and killed my kefir grains. I left them in the fridge without feeding them for probably 6-9 months. One jar has some pink color to it. Is there any way that I can make them healthy again or are they done for good? Nope there probably done they haven’t had food for a long time and the bacteria will die. First of all, thanks for providing such a great resource! ~ how much (if at all) will stress impact the longterm health of the grains? I’m especially nervous about this since my grains are sitting in the post office overnight tonight in their packaging for an extra night… I thought they would arrive today, but the tracking info had delivery scheduled for tomorrow so I shifted my all day city errand trip to today (rather than going tomorrow as planned) and, wouldn’t you know it, they did in fact deliver to the PO this morning; I missed getting back into town in time to pick them up by about 15 minutes. I know they will probably be okay, just hungry and a possibly a bit stressed, when I pick them up tomorrow morning… but it got me thinking about whether or not the stress affects them into the future. What are your thoughts on this? I guess it would also apply after refrigerating for vacation, etc… Do these types of stresses cause lasting affects to the health and vigor of the colony? If so, is there anything that can help them rebound better from periods of stress (like shipping or cold storage)? 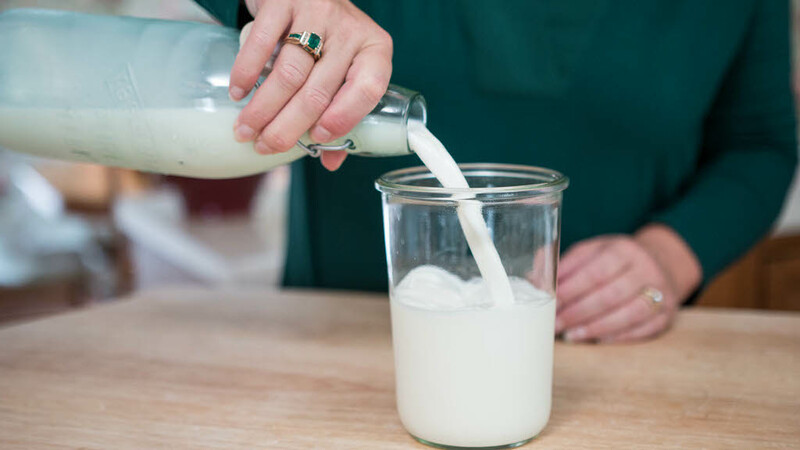 ~ you mention that raw milk with cream can create an “off” or “yeasty” flavor… is this only for milk with a thick cream top in place or for all high fat/high cream content milk? My mini nubian does (one in particular) put off some pretty rich and creamy milk, so I am wondering if I need to let it sit in the fridge for a couple days and then skim the cream before culturing. Do you have any idea how the cream/butterfat content of the milk affects the health benefits of the kefir? ~ how much headspace in a jar is too much for culturing? for second ferment? I believe I read that you recommend to only fill a jar 2/3 – 3/4 full, but is there such a thing as too much headspace/air in the jar? 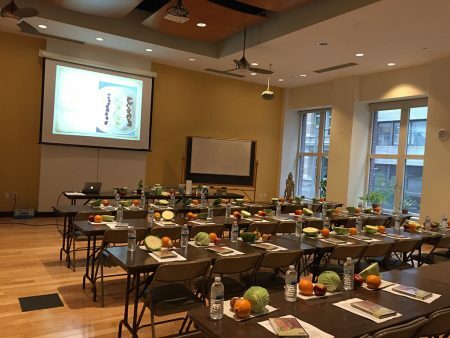 Thanks again for providing all the fantastic info and products… It is clearly a labor of love and is truly inspiring! Your grains will be fine and can last longer than two weeks but what happens when they are stressed is they get rather large and big. This is not bad just means they’re looking for more surface area to absorb food. Goats milk is different than cows milk and the cream might not be a problem tasting yeasty. Leave a little room for it does expand and it doesn’t matter if the jar has lots of room doesn’t hurt anything. Hi, I bought your book. I got Kefir Grains and I have fed them twice. When I strain the kefir from the grains, there is a lot of small white crumbles along with the less white fluffy grains. Should I get a bigger strainer so the white stuff goes in with the Kefir or should it stay with the grains? Also, should I be rinsing the grains with milk before I feed it? You do not need to rinse the grains and you don’t need to keep the fluffy stuff with the grains. It works great with out it. 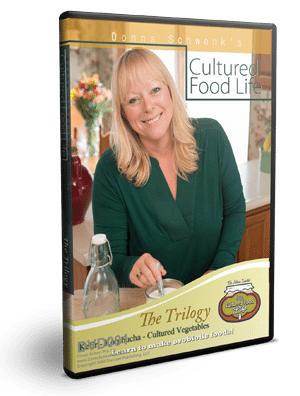 I now have SOOOO many kefir grains – maybe 3 cups of grains – and my hubby and I have recently learned they can be eaten, but one must start slowly when including this in the diet. Meanwhile, they multiply. Is there a ”safe’ way to dehydrate/freeze them? Dehydrating and freezing them always seems to diminish them so I don’t recommend it. Hi, I am pretty new to your site and am DESPERATE for healing. I am 64 y/o 3 yrs ago I had heart surgery and contracted invasive candidiasis. Doctors refuse to even discuss the problem, it has invaded my entire body including my brain and eyes, it has eaten the fat and muscle in my arms and legs to the point that I am almost crippled,on x-rays you can see where it has even chewed on the bones. In the last 6years I have had stage 4 kidney cancer and two aortic aneurysms they removed the kidney and have repaired one of the aneurysms. I am also insulin dependent diabetic, I firmly believe that all these problems have their root in a long standing candida over growth. Can you offer me any help, PLEASE………. no one else will. 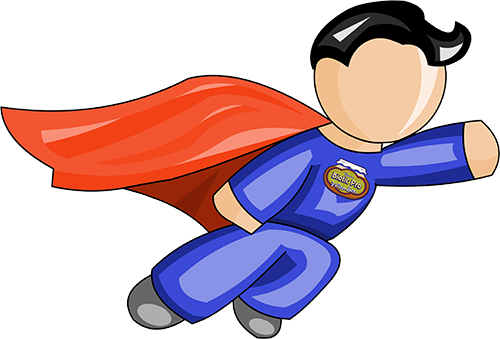 Start with my free ebook at the top of the page on my website and it will help you get started. Pick one thing to try and be easy about it. The body can heal you it was designed to do so. It just takes a little time and learning. Dennis… Would love to hear how it is going for you since its been about five months. Pray for healing for you. 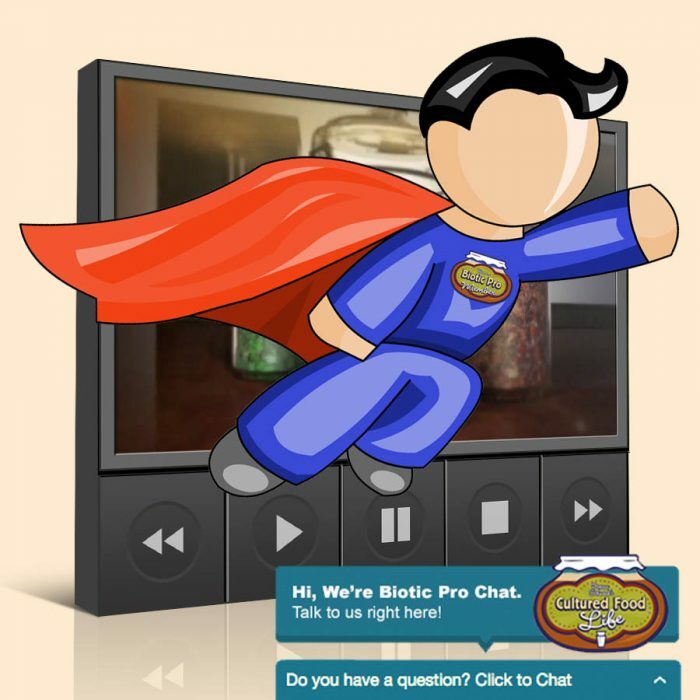 Your site is great! I am just a beginner and got some grains from a friend. My question is about consistency. 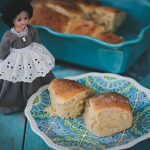 Mine is buttermilk consistency, but I see other pics online of a thicker consistency. Can you clarify? Thanks Donna! 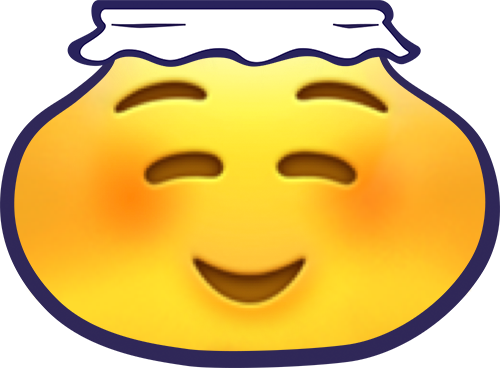 I just read your entry about traveling with the dried kefir. Is it possible for me to transport live milk kefir grains from the US to Hong Kong. I am in the US now and will be traveling home in a couple of weeks. Or would you just recommend getting new kefir in Hong Kong. You can try but you know Im not sure if they will let you but its worth a try. Your grains should be fine packed in a little milk in your suitcase. Thanks again…I will give it a go and see. I am taking a class on kefir when I get back to Hong Kong so if my grains do survive the trip I can get more once I am back. I am considering making kefir because of how healthy it is. 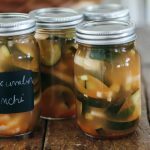 I am a huge fermentation nut, but I want to try my hand at making it rather than buying it all the time. I have some questions. 1) can I use my mother in laws grains or would yours be better quality. She makes very thick lovely looking kefir. 2) I drink goat’s milk but not cow milk due to tummy weirdness with cow milk. Do you think there is enough cow dairy in the kefir grains that using them to make coconut kefir would be a problem? 3) I did try making goat milk kefir maybe a year ago and a friend gave me some goat milk kefir grains. The milk rotted. My only source is uht milk. Is that a problem? 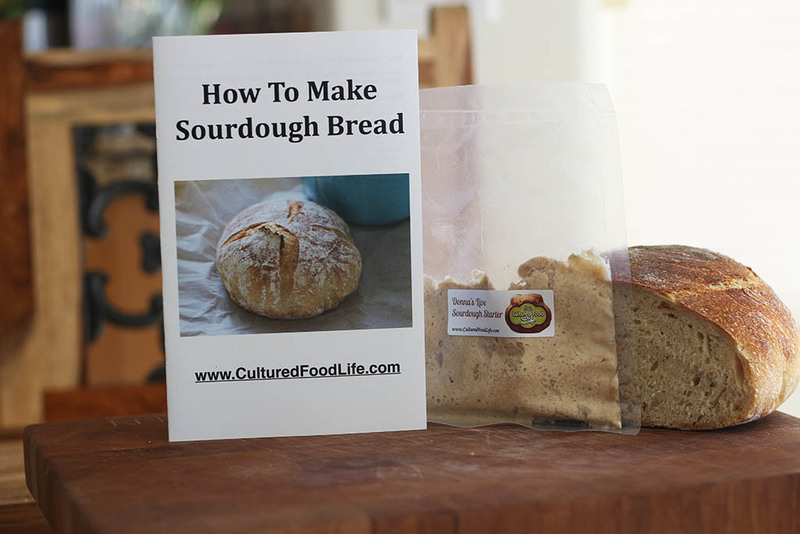 4) the second ferment is a great idea! I just want to confirm that I don’t still have the grains in the jar right for the second time around? 5) I primarily want to make coconut kefir. 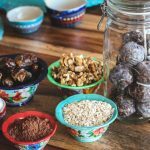 If I can use dairy grains, do I need to gradually get them used to coconut milk? From your page on that, it didn’t seem like it would be a problem? 1. Yes, use your mother in laws grains they sound great. 2.You can use them in goats milk or coconut milk but if you use coconut milk you’ll need to refresh them once a week in regular milk. Goats milk there is no need to refresh them. I made my first batch of kefir today! But it took FOREVER to strain. I used a 4 in nylon strainer and the kefir sat for abt 29 hours. Any ideas? Should I aim to make the kefir thinner (it was pretty thick) or get a different strainer. The one I used looked the one in your picture. You should take a rubber spatula and move it around until the kefir strains through the mesh strainer. Stir kind of vigorously until it goes through. 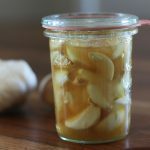 If I have 2 separate jars of double-fermented kefir in my refrigerator and they were made on different days, is it OK to combine them in one large jar? Firstly, you have helped me immensely in the world of kefir, and for that I thank you!! 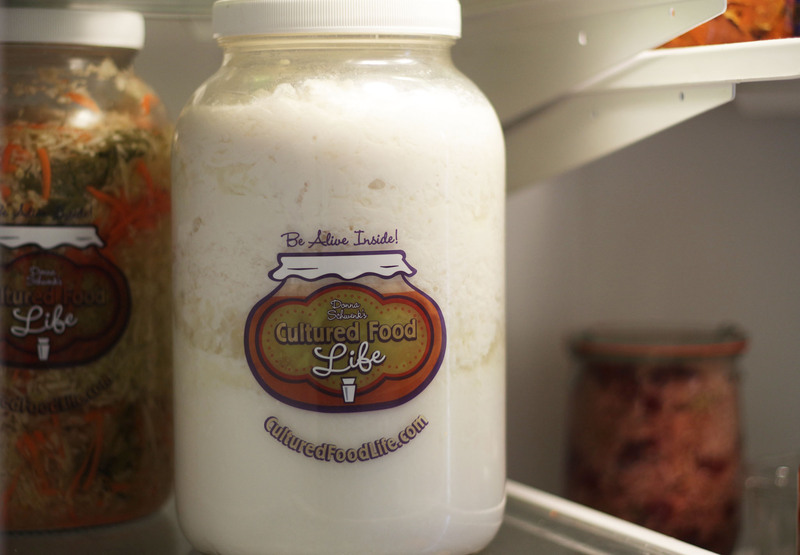 I have always wondered if it’s safe to have one large ‘kefir jar’ in the fridge (let’s call it a gallon for fun) and every time I make a cup of fresh kefir, poor it in the jar. I have a hard time keeping up w/drinking it even when I make only 1 cup batches at a time (w/ a second ferment). So I’m hoping a can create some sort of kefir dispenser in my fridge (so that I don’t have an army of jars) but not sure if it would taste bad or be safe… I’m thinking one of those glass beverage containers with a spout for easy pouring. I enjoy mixing my second ferment (lemon) kefir with plain, organic yogurt. 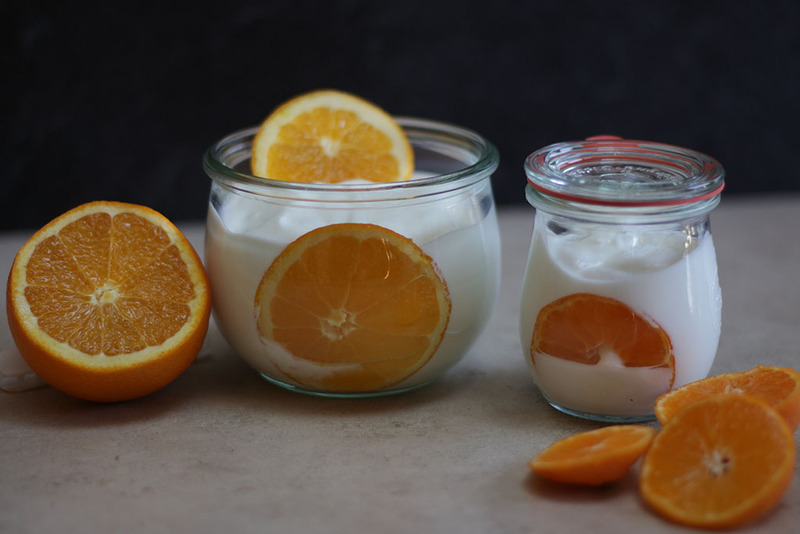 It creates a nice, light, fizzy yogurt. 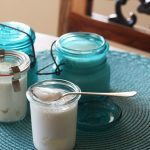 Am I harming the probiotics in the kefir by mixing it in with yogurt? No, it wont hurt it to mix it with yogurt. I am also making yogurt for the first time (using a thermos), and will be straining it overnight so it thickens. Is yogurt whey as healthy as kefir whey? Should I even keep it? How can I use it? It is not as beneficial as kefir whey but is still good for you. 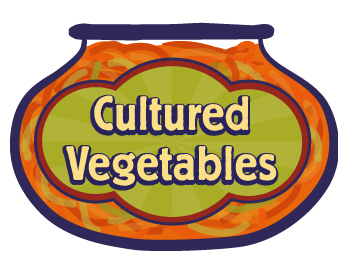 You can use it to make cultured veggies although I don’t like the results as well. You will also need to use it within a few days of straning. 1) How often should I change the milk in the jar with the grains? 2) When I’m ready to make a new batch of kefir, do I remove the grains and put them in fresh milk and let it sit covered on my counter for 24 hours? 3) How long will the “finished” kefir last in my fridge? 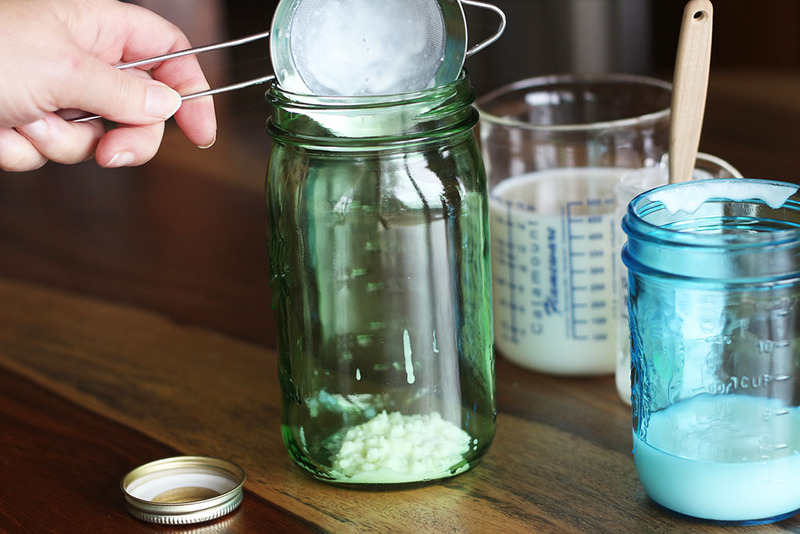 4) The kefir has separated in the jar with a thin, watery layer on top. Can I just shake it up and drink, or do I pour off the water layer? And one more: I’m assuming the watery stuff on top is whey. Is that OK to drink for people with IBS? 1. You should have to change the milk every 24 hours. 2.Yes remove the grains and add fresh milk and let it sit on the counter for 24 hours. 3.It will last many months in the fridge. 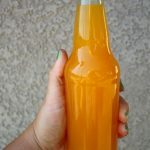 4.Yes, shake it up and drink it. Thank you! 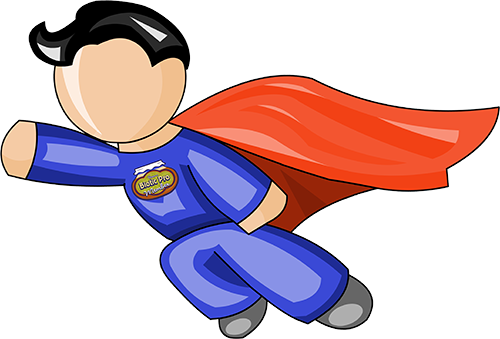 I’m not sure you can even imagine how many people you are helping with this website! I ran out of milk after my kefir was already in the counter for 24 hours about. I won’t be able to get any more milk for about 3-4 days- will it be ok if I don’t strain and just put a lid on the jar and put in the fridge until I can strain and put fresh milk over the grains? No put it in the fridge with the kefir it has made. It will die without some food source. Yes, I think it will be ok.
Another question…what is your opinion of keeping the Kefir grains in a muslin bag while fermenting? 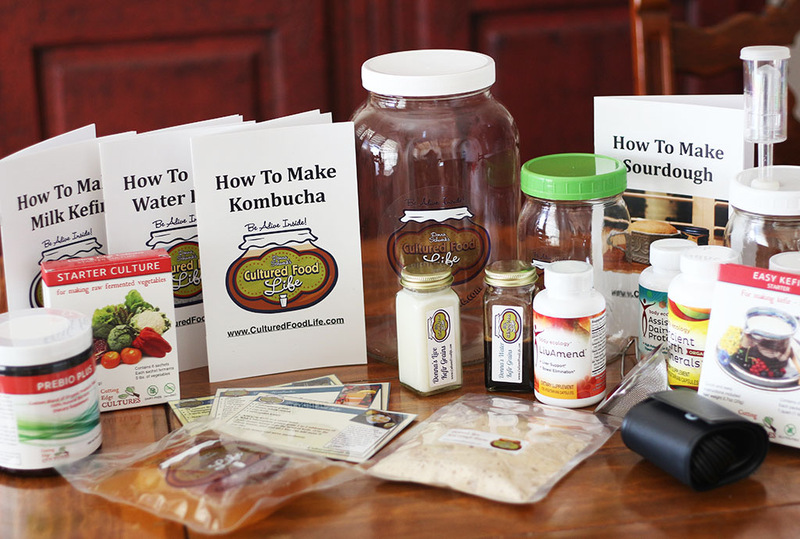 I have one of these bags and it definitely makes the process easier and my Kefir is still very thick. Just wanted to know if this is a good idea long term. Thank you! I just discovered your site. It’s wonderful! I’m learning so much! I was wondering if raw honey can be used for the second ferment. I’ve read some conflicting information on the web that raw honey shouldn’t be combined with Kefir. 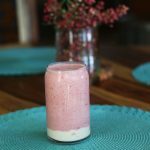 If not in the second ferment, is it okay to use when making a Kefir smoothie? Thank you! You can use both and it will work great and be fine. I want to try second fermenting with vanilla extract. How much do you use? Just a teaspoon is all I use. 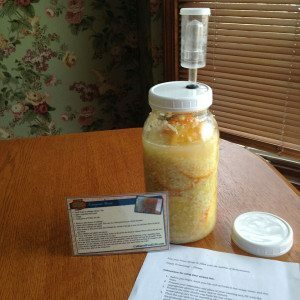 I am just starting kefir. In the steps to make kefir milk you said to avoid metal but all the pictures show a strainer that is metal. And you say to use a fine mesh strainer. All I have ever seen and have are metal. Is this ok to use? I have been using a plastic spoon, but I’m afraid the holes might be too big and I’m not catching all of the grains. 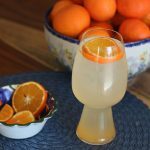 I’ve been reading articles that say you need to take a break from kefir every twenty days or so. Do you agree? Also, do you ever eat your grains? No you do not need to take a break from kefir every 20 days.Yes, I do eat my grains I blend them up in the blender with a smoothie. If I want to make 1 quart of kefir, how many tablespoons of grains do I need. Seems as though I’m getting different amounts depending on which website I’m reading. 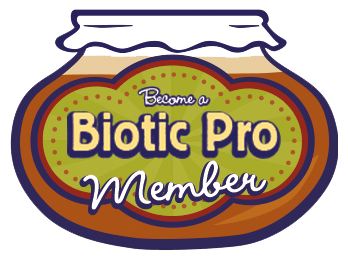 1) Because of my stomach issues, I read it’s best to proceed slowly with adding probiotics to your diet to avoid side effects. I am currently drinking 2 tablespoons of kefir a day, and every 5 days will up it another tablespoon until I hit 8 ounces. Should I wait to try my fermented carrots until my body gets used to the kefir? What do you recommend? 2) Can I make kefir using organic non-fat milk? 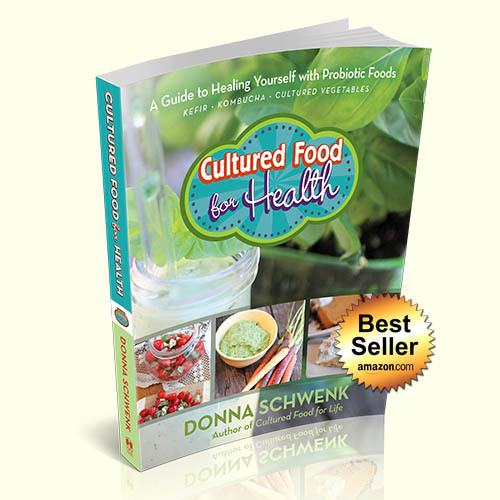 3) Wilk I lose the probiotics in kefir if I heat it up or use it over hot oatmeal? Yes, your doing great and this amount of kefir is perfect. 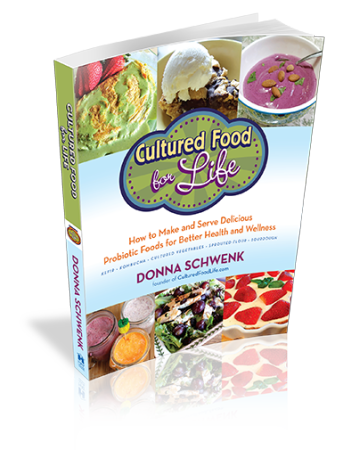 Wait on the cultured veggies until your body is use to the kefir but if your not feeling discomfort than go ahead and make them. Yes, you can use organic no-fat milk. 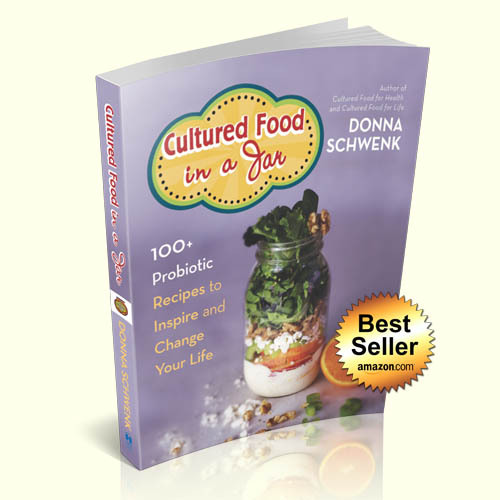 If you heat it above 115 you will start to kill the probiotics. You can do this if it is working for you. I’m enjoying my morning kefir drink, thanks to your patient guidance. I’ve been making a few days worth at once as the grains are growing fine. Here’s my new question: I was pouring milk over the grains to store in the refrigerator for the next few days, and toward the end the milk was clumpy! Is it okay for the grains to stay in this milk, and then ferment, or should I get new milk at least for the fermenting? Sorry to bug you AGAIN. Thank you! You need new milk to ferment them in, for they will have eaten some of the lactose out of the milk and then won’t ferment properly. They are in the refrigerator in the “bad” milk now; I don’t plan to ferment them for a few days. Should I get new milk, strain the grains, and put them back in new milk in refrigerator? Is that enough, so that I can them just use that same jar containing grains and milk to ferment? Thanks – really sorry for the questions. Yes put them in fresh milk right away and then put them in the fridge or fermenting them would be better. Yes, you can use the same jar. My friend just shared her kefir with me last night that was already fermenting. I put it in the fridge in the morning and separated about 6 hrs later. It seems just a little thicker than whole milk. Maybe I should have let it stay on the counter longer? I added lemon zest and am going for the 2nd fermentation. I don’t mind having a thin batch, but did I harm the grains or do I just need to let it sit at room temp longer next batch? Yes, let it sit out a little longer and see how it does. So if I drink the first batch is there any danger if it didn’t ferment properly? I just don’t want to drink plain old sour milk! Sorry for the confusion. Also, could I use honey with lemon for the 2nd fermentation? Well if its sour its ferment but if it taste rotten than it hasn’t fermented proberly. I received my grains a couple of days ago. The first two batches were fine. But the third batch separated after 17 hours. I am using skim milk does this make a difference. You probably are needing to add more milk because the grains are growing. Skim milk does ferment faster as well. I use raw cow milk to make my kefir. Today, I ran out of milk and I won’t be able to get any for another 24 hours. My keifer grains have been fermenting for 12 hours. The mixture is slightly separated with cream stuck to the side of my jar and streaks of yellow liquid running throughout. I am thinking that since I can’t get more milk for 24 hours that I need to slow down the fermentation process. Should I put my kefier (with the grains) in the refrigerator until I get more milk? Yes, put it in the fridge to slow down the fermentation. I received my grains 2 days ago…..thank you very much! It was very thin yesterday after 24 hours but I went ahead an separated it anyway. I am wondering if I put too much milk in the jar for the amount of grains? I didn’t put as much milk in this 2nd batch I started and it looks like it may be getting thicker when I checked it out this morning. Any advice for me since I’m new at this? One more thing on my new Kefir grains that I got a couple days ago…today it looks like I have 3 layers in my jar….there is a bottom layer, then the middle layer is sort of clear and the top layer which is sort of grainy looking…….am I doing everything ok with the Kefir? Thanks so much! Yep, you are its probably just ready and starting to separate and that’s ok. Just strain and add more milk and start again. Your doing good. they will grow and need more milk but in the beginning they will need less. They grow fast so watch them.